Why not Three Wheeler Scooter ??? As the schools have started it's my daily routine to drop my kid to school and struggle for parking and struggle in traffic as most of the parents come to drop their school in their cars. Some time I feel to buy a Two Wheeler but I am afraid to use the same because it's not safe at all and I can't risk myself or my kids or my wife or family member for the same. May be some forum member will disagree with me about my being paranoid of using two wheeler. I sometime wonder why Honda / Bajaj / Mahindra / TVS / Etc..... don't come up with product which is (1) 'reasonably safe to drive' as well as (2) practical for commuting in city with (3) best possible mileage and (4) with acceptable price tag. if we ask to Honda / Bajaj / Mahindra / TVS / Etc..... they will say they already have best bikes and scooters at lowest possible price with best possible mileage. (a) What about basic safety in your two wheelers ?? Safety always doesn't mean to have Airbags and other modern safety techniques but atleast the product should be safe basic terms. For e.g Two wheeler commuter need to balance themselves while riding on it and if for some reason it's out of balance there is risk so two wheeler doesn't provide basic safety and it require concious mind to be safe. ( Is it safe for me or my wife or kid or my any other family member ? © Are they assuring that It won't skid on wet surface ? (d) It won't fell down if somebody hits them ? (e) It will protect during rain as well as will protect from sun ? (f) Or it will protect their face from dust or any particles coming from front ? These two wheeler manufacturers put blame about safety for not wearing "HELMET". Is HELMET is enough for safety ?????? The main point here is our Indian manufacturers lacks innovation and they are not concerned about precious life of their consumers. They are more focused on commercial success , profits etc.... than to develop an entirely new segment or product from scratch which at least guarantee basic safety with low price tag , good mileage and practicality of two wheeler for which people love to own one two wheeler even if they have a four wheeler . Our Indian manufacturers are expert in copying than to create a new product with their own capabilities and expertise because an entirely new product involves lot of R & D and efforts. Our Govt / Media agencies and various other health departments shout out loud about health risk for smoking cigarettes or tobacco products and spend fortune amount to pass message to people for it's dangers and to avoid consuming the same but have anybody studied DATA of deaths due to TWO WHEELER ? Now to whom we should blame for this ? (e) TWO WHEELER itself ? Answer is very clear " TWO WHEELER itself "
The reason for my writing all above is , why can't the two wheeler manufacturer come-up with product such as THREE WHEELER SCOOTER ??????? What is the problem ????? Is gov't is hindering or our Motor Vehicle Rules don't allow such products ?????? Or OUR INDIAN TWO WHEELER MANUFACTURERS are DUMB for not even trying a new concept ?????? ?/ Or there is something else ? ?????? Don't you also agree that these kind of product seems more practical and may bring or attract more customers and is more commercially viable than two wheeler or four wheeler because two wheeler need skill of balancing and four wheeler need skill of driving by understanding mechanism of clutch break and control on accelerator etc... which is not easy for many people. 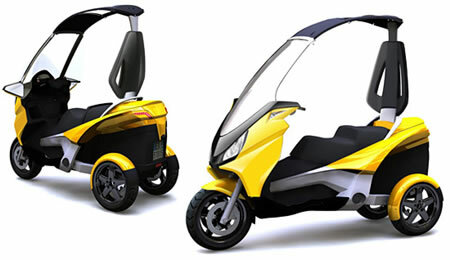 Three Wheeler scooters are compact in dimensions for easy manoeuvrability in traffic and can be parked in shortest possible space and will have much better fuel efficiency than a four wheeler atelast. Even if we put aside all other points are don't you agree that Three Wheeler Scooter are more safe than a two wheeler for us as well as for our family members ? ? ? We can be tension free if we give it to our college going kids or if our small kids have gone out with their mummies to school or market etc.... Or Aren't we safe while going for office on three wheeler scooter instead of two wheeler ? ? ? ? Three Wheeler Scooter is not a new concept but it should be implemented and offered to consumers as an option to the two wheeler or four wheeler. a. They are stable. No question of losing your balance. b. Affordable, unlike heavy motor cycles. c. They are easy to park, unlike cars/SUVs. d. Powerful enough to compete with 4-wheelers in speed. driver feel as if he is turning only one wheel (like a two-wheeled scooter). GUYS OF THE SCOOTER COMPANIES ARE DOING ? I have also seen 3-wheeler scooters being used by Police personnel in many cities. I also saw a number of 4-wheeler-scooters (two in the front and two in the rear). But, these are rare. powerful 3-wheels-scooter than a car. It is also less polluting, so they get better tax breaks and pay less road tax. Two deaths and one in coma because of "TWO WHEELER" in two days. These are just two reported incidents there may be several other 2 wheeler accidents and deaths in Mumbai city as well as across India in single days. Hope two wheeler manufacturer find some safety feature in their two wheeler which doesn't cause death or serious injury OR introduce three wheeler scooter which will atelast reduce number of "deaths". just want to convey message to all two wheeler manufacturer - - - - - to value human life - - - - - - to innovate for safety of their own customers - - - - to bring products which are really meaningful and reaches to maximum number of people.- - - - - - It's not very difficult for "Cash Rich" , "Profit Making" two wheeler manufacturers. Own active / aviator from 5-6 years and looking for upgrade, but don't have anything worth upgrading in market. @Tanhyd I have Amaze and I don’t own a bike. For all my petty chores I drive my car. 4 wheeler is safe. Any distance more than 200m I drive my car, parking, I manage to get. Dear Mr tejas, mr ramesh and Mr tanhyd. For years, I am struggling to get a practical vehicle with combined features of car and bike. I contacted lot of car / bike manufacturers. But no body bothered to reply me. Even contacted DCdesign, but no response. I have seen lot of innovation in west about such vehicles, but nothing in India. Every body here want to sell stupid useless cars to us, which is of no use in cities. I have seen some foreign vehicles like tango, lit motors, colibri, twizzy, lumeneo samera, toyota iroad, nissan single seater. But all cost us in crores and lakhs. In Indian market I have seen L1 and delight by some innovators. But all efforts gone away. Now looking forward to udo and bajaj ucar. Bajaj qute and nano are not something what we four need. Can we four and others with similar interest can do something about it. Lets all contact DCDESIGN. Lets we all order our own custom vehicle. Or kindly you all suggest your ideas.